As a family we have been holidaying at “Warriwillah Cottages” every year for over a decade. In that time we have been able to enjoy the benefits of close proximity to local beaches including Broken Head, Byron Bay, Lennox Head and Suffolk park, and a quite rural setting for relaxing evening bbq. Warriwillah Cottages have satellite television and dvd facilities to cater for all groups. Cooking and bbq facilities meet all needs. 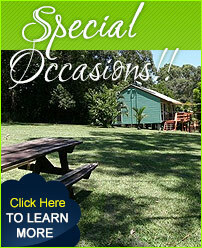 We strongly recommend Warriwillah Cottages. Kerri and Gerald Feeney, Brisbane. Always love our time at “Warriwillah Cottages” in it’s tranquil rural location and but still in the middle of everything. Reviewed 23 September 2008 After a ruckus with our pre-booked accommodation at Belongil Beach House for my friend's hen’s weekend we were in trouble with no accommodation on the first day of the school. We went to the Byron information centre and the lovely lady at the desk suggested Warriwillah to us. She explained to the owner the dramas we had and the fact we were a hens weekend and he still welcomed us with open arms!! Just 10 minutes out of Byron Bay we stayed at a gorgeous cottage with fabulous views, lots of room, plenty of beds, a pool, a big veranda and everything else you could want!! We were so lucky to have found accommodation on such short notice, let alone the best place we could have possibly hoped for! I'll be telling all my friends and family, and plan to go back for another holiday! Thank you Herb, you made my friend's hens weekend the best it could be!! All rights reserved by [Warriwillah Cottages]. Best viewed in IE7+ with 1024 X 768 pixels. Created and cared by Techno Developers Group.